When you play Etrian Odyssey IV, be warned: you are going to die. I don’t mean this in the larger, physical sense, (though yeah–I mean–that’ll happen too, I suppose). What I mean is this: when you pop Etrian Odyssey IV: Legends of the Titan into your 3DS and boot it up, you should do so prepared for repeated failure. That first humiliating death may come at the hands of a monstrous, uber-powerful bear or a run-of-the-mill grasshopper, but that’s really neither here nor there; what matters in Etrian Odyssey IV is how you bounce back after that. Trial-and-error and standing up after getting knocked on your rear (again, and again, and again…) are the name of the game, and this fact makes for one of the best JRPG experiences on a system quickly becoming known as a destination for quality JRPGs. 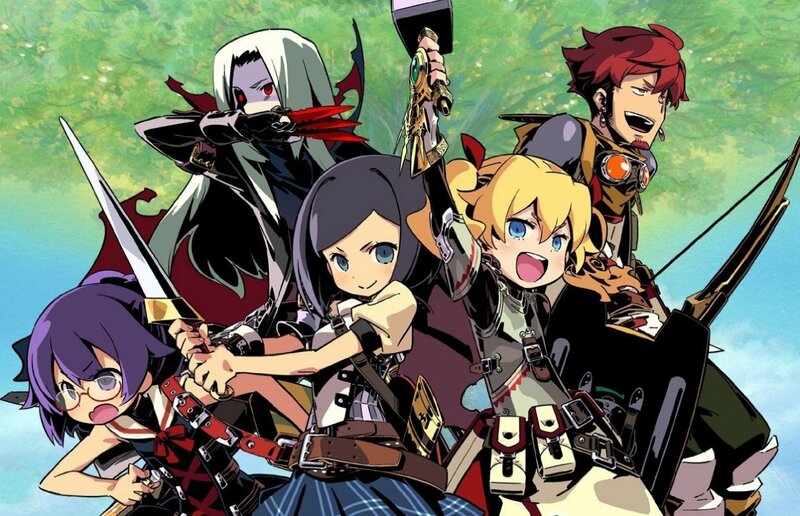 Etrian Odyssey IV: Legends of the Titan is a dungeon-crawling RPG cut from old-school cloth. It’s a game that will frustrate you, infuriate you and make you feel like throwing your system against the wall. In spite of these feelings, or perhaps because of them, the game happens to be one of the most rewarding and customizable role-playing experiences on the market right now. The game unfolds from a first-person perspective as you traverse dungeons large and small, one tile at a time, battling roaming monsters which searching for treasure to plunder and bosses to fell. The colorful, lush graphics are a treat to behold (even if the various dungeons within each of the game’s several areas end up looking very much the same). Characters are portrayed in gorgeously hand-drawn sprites, and the 3D effect is generally well-used and unobtrusive (but the game is, of course, perfectly playable with that feature turned off). Like many old-school RPGs, Etrian Odyssey‘s story is negligible; players hoping for an engrossing, sprawling epic that will keep them hooked with plot twists and interesting character arcs should look elsewhere. You control a band of adventurers charged with, basically, adventuring your way through a bunch of dungeons in order to discover the secret of a mystical tree called Yggdrasil. Etrian Odyssey‘s draw comes from the thrill of adventure and the adrenaline-pumping strategy of nail-biting battles rather than from interpersonal drama and character development. Etrian Odyssey IV plays like a traditional dungeon-crawler, but the addition of an extensive mapping system helps the game stand out from other entries in the genre. When exploring dungeons, all action takes place on the top screen, with the bottom screen acts as an area map–not an uncommon thing, right? Well, Odyssey‘s map only auto-fills tiles you’ve walked over, providing no extra detail or context like, say, where a door, wall, save point or treasure chest resides within the terrain. That task falls entirely to the player, who is provided with an extensive selection of icons with which to mark points of interest. This makes the player an active participant in exploration and forces him to fend for himself when it comes to figuring out where he is, rather than simply relying on a game-provided pre-made map. It seems like a small change on paper (no pun intended), but in practice it makes a world of difference. Etrian Odyssey IV may not have a terribly engaging story, but there’s no doubt that its players get to take an active role in building and shaping the world around them, literally. Characters in Etrian Odyssey IV are, personality-wise, blank slates. At the game’s outset, the player is charged with creating a band of five adventurers to take out into the world. Choosing from seven classes (which later expands to 10 as the game progresses), the player chooses a character model (each class has a handful of skins) and a name and, well, that’s it. Aside from developing abilities through a set of skill trees as characters level up, actual in-game character development for your party more or less ends there. This isn’t to say you won’t form a bond with these players–quite the opposite, actually. The first time your sniper takes out an enemy with a particularly powerful shot or your medic saves another character with a healing spell just in the nick of time, you’ll find you’ve grown quite attached to these characters. Relationships are forged in the heat of battle, even if it is one between you and a mute mage that exists almost entirely in your mind. Classes are nicely balanced and diverse enough to make almost any mix of characters viable. There are three classes to unlock throughout the course of the adventure, and midway through the game the player is introduced to the concept of subclasses, which exponentially increases the ways you can mix up your party. You have to make a party of five at the very beginning of the game but you aren’t locked into that by any means; tinkering and experimenting with your party’s makeup throughout the course of the game is a highlight, as whenever things start to become too predictable or stale, it’s easy to throw out what you’ve been working with and start from scratch. And luckily, there’s no obvious game-breaking party makeup that will allow you to power through the game unhindered; the game is balanced in such a way that you’ll often feel your party is just one character short from obtaining that uber-party state, which helps retain the challenge throughout without feeling cheap. Legends of the Titan is not a game that holds your hand. The game puts a lot of the onus of figuring out play mechanics and messing with features squarely on the shoulders of the player. No constant tutorials here; players are given just enough information to understand the basics, then left to their own devices. This encourages experimentation and tinkering throughout the experience, and the game is better for it. To put it bluntly: Etrian Odyssey IV can be hard. This isn’t an RPG where players can breeze through battles mashing the A button over and over until all the enemies on-screen disappear. In Etrian Odyssey IV, practically every battle is a challenge and all require the player to stay on his toes and think strategically if he’s to have any hope of surviving. It’s not terribly uncommon for the entire party to be decimated in a seemingly-routine random encounter, especially if they’re just trying to breeze their way through an encounter. Every battle demands your attention and quick-thinking for success. Not only that, but each dungeon (and the overworld) is infested with a handful of monstrous beasts, which the game dubs “FOEs,” roaming about the map. FOEs are perhaps where some of the game’s biggest challenges emerge. These bosses are often powerful enough to make any encounter extremely challenging; if they don’t eviscerate your party with one stroke (spoilers: they totally will), you’ll scratch and claw your way through every little bit of damage. These beasts will move in tandem with your party once they’ve been alerted to your presence (moving forward or backward one tile for every move you make, for example), adding an extra layer of strategy to moving around certain areas of most dungeons–especially when, for instance, two or three FOEs are roaming in direct proximity to the treasure you’ve entered the dungeon to obtain. This difficulty can lead to some infuriating battles and, again, more than a few party deaths, but that makes them all the more rewarding when you’ve finally pushed through that barrier with a combination of trial-and-error, strategy and critical thinking. Forget achievements or trophies; in Etrian Odyssey IV, the sheer sense of accomplishment is more than enough reward. The game’s inherent difficulty can be infuriating, and worsens depending on what “difficulty level” you choose at the outset. The default setting is the traditional, punishing Etrian Odyssey fare. Death will eradicate all progress you’ve made since your last save, including any levels, experience or items gained, which can make for some truly maddening play sessions if you get taken out by a random encounter and lose an hour of progress. New to this game, however, is a “casual” mode, which merely punishes failure by sending players back to town with a lighter wallet for the trouble (which can still be frustrating if you get taken out in the lower levels of a dungeon). The settings see almost no difference in terms of overall difficulty–you’ll still get torn apart by those FOEs on casual mode–but rather in the punishment for failure. Etrian Odyssey IV is an homage to a style of game-making that’s no longer at the forefront of modern development. It’s a game that teaches players to swim by throwing them into the deep end and watching them flail about until they get it. That can be frustrating at times, but players who take the time to dig deep and keep trucking will find an experience that rewards critical thinking and player ingenuity. Etrian Odyssey IV doesn’t reinvent the wheel, but it doesn’t need to. It knows exactly what kind of experience it wants to deliver and it sticks the landing. Your mileage may vary, but it’s absolutely one of the best JRPG experiences on the market and worth a look from fans of the genre. Etrian Odyssey IV: Legends of the Titan was developed by Atlus and published by Atlus and Nintendo. A digital copy of the game for the 3DS was provided for review purposes.